Shea butter is derived from the nutty fruit of the Shea tree, which is native to the savannah of central Africa. The Shea tree reaches a height of about 15 meters, while its fruit is roughly the size of a jumbo olive. Once dried and cracked open, the Shea nut is revealed. Ripe Shea nuts contain a rich creamy liquid high in essential fatty acids and rich with vitamins and minerals. It is from this cream that Shea butter is extracted. 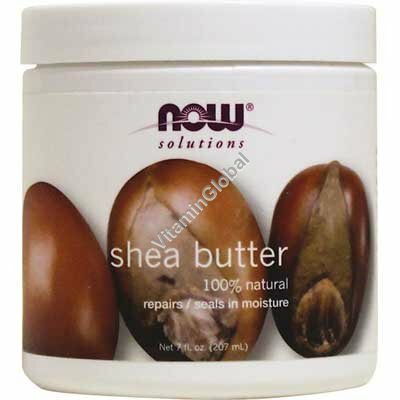 Now Foods's Shea Butter is 100% pure, and can be spread on all parts of the body. This product is naturally hard and color/texture will vary depending on temperature. This product will melt when warmed above body temperature and become solid again when cool. This is natural and may affect the appearance, but will not harm the quality of the product. This warming and cooling may produce fat crystals affecting the color/texture making it appear grainy or uneven. If hard, shea butter can be softened by placing in a pan of hot water for 30 minutes or microwaved until soft.